The Thompson Fat Pad by Rogue is the proper bench pad to maximize power and minimize injury. Donnie Thompson (checkout his bio below!) invested seven years of research in creating the Fat Pad. Common Pec Tweaks are a thing of the past! Angry Humeral wear on the bicep tendon and soft tissue GONE! The Thompson Fat Pad is designed to bolt onto any Rogue Flat Bench. It has a plywood bottom that enables it to be mounted to most other benches as well. Drilling and additional hardware may be required if you are mounting to a non Rogue product. In 1998, Donnie started competitive powerlifting. He is the first human to ever total 3000LB a mark that still stands today. Donnie has 8-all time World Records in Professional Powerlifting. Includes; 3 Bench Press records, 2 Squat records and 3 Total records. Donnie is currently the Strength and Mobility Director for 22 physical therapy clinics throughout South Carolina. 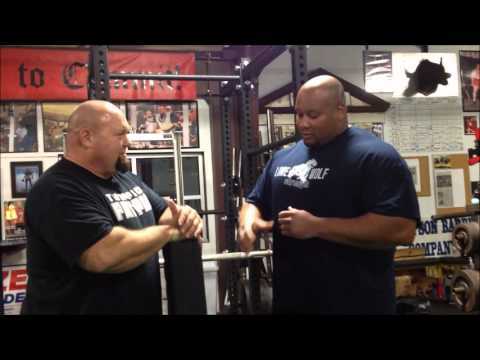 Donnie travels to many Universities and High Schools around the country teaching and sharing his Powerlifting, Kettlebell training and Mobility work methods and experiences to the football teams and coaches. "I have had zero shoulder injuries in my weight room since I have been using your Fat Pads. Not only do they work great, these big athletes like the comfort of them when they bench. They hate going home and using their old benches!" "Grabber" vinyl cover, holes placed to fit any Rogue flat bench. Thompson Fat Pad is rated 5.0 out of 5 by 34. Rated 5 out of 5 by Jim C from Really stable bench I started training on this a few weeks ago and it has made a huge difference in my ability to recover from bench workouts. The usual pain in the pecs and shoulders has really been minimized. I initially had some issues with mounting it to my bench, but I took the pad to the local hardware store and we eventually found that the best bolt for it is a 3/8, 1 inch bolt with course thread. It wouldn't take with a 3/8 bolt with finer thread, but the course thread works perfectly. With the added height of the pad, you may need foot blocks or plates to set your feet, but that is easy to do. All in all, this is an excellent addition to my gym and it will get used weekly. Rated 5 out of 5 by Maasboss from Perfect I bought this pad in hopes it would give my shoulders extra support as well as improve my already stout rogue flat bench. Wow. Wow. Wow. Very impressed with grip, size, width, and tank like feeling of this pad on this bench. Did bench immediately after receiving this beast of a pad in the mail and I am currently convinced I just bought a game changing piece to my ever expanding home gym. Thank you rogue. Rated 5 out of 5 by JesseJ from Best bench pad you will ever use!!!!! I was hesitant to believe all the hype surrounding this pad, but I have started to experience a lot of pec and shoulder issues. Shipping was extremely fast and I benched with it the first night. I had a rogue bench already so installation took less than 5 minutes. I benched that night and could immediately tell what people were talking about with it helping pec and shoulder issues. Worth every cent. Rated 5 out of 5 by attebury from Worth every penny I was skeptical of the claims surrounding this bench, but decided to take a chance on the Fat Pad and I am glad that I did. The width, grip and depth all combine to keep my back tight and my shoulders secure. I'd been rehabbing my left shoulder for 6 months and while it had improved, progress had been slow. Now two months after using the Fat Pad, my bench is back to where it was pre-injury and my shoulder feels great. If you're in the market for a bench and/or want healthy shoulders, it is worth every penny. Rated 5 out of 5 by Jonathan from If you have shoulder problems get this now! I am a current top 5 bencher, [email protected], and have been suffering from shoulder problems that have not been able to go away. I still compete so not benching is not an option. Getting frustrated that my shoulder issues are holding me back I have tried a lot of things and finally tried the fat pad, my shoulders got noticeably better. By the 3rd week of using it my shoulders no longer hurt at night keeping me awake like they used to. They are improving each week where benching isn't irritating them any more. Some may worry that with training with this wide pad when they use a competition bench it will throw them off. While the setting up is a little different, I would rather have my shoulders pain free and adjust. Last week I went to another gym and used the competition bench and my shoulders hurt at night again. I was able to set up okay on that bench and still bench 420x4 so it didnt throw me off. And the grip on this pad is awesome, there is no chance of sliding. best gripper pad I've used. Rated 5 out of 5 by CMC51 from Awesome! Best pad - ever. I will never go back. Mounted it with 3/8" x 1-1/4" lags. Drilled 1-1/4" deep in to the bottom (see picture)- plenty of wood there. Rated 5 out of 5 by Greg51 from Exactly what I hoped for This is an outstanding product. It’s very sturdy, and versatile - I had no trouble mounting it to my (non-Rogue) bench. It has helped me tremendously with some issues I was having related to shoulder injury and poor shoulder mobility. I highly recommend it for any lifters with those sorts of issues. Rated 5 out of 5 by JC Fitch from Shoulda got this first time around Even without a pick I can set my feet, retract my shoulders properly, my traps "bite" down and into the pad. Reps are fantastic with this as it helps keep me tight the entire time. I don't have to worry about pushing myself back off the pad. It is a little more difficult to set my legs as I'm a really short guy. Absolutely love this pad!